This is part one in a 4-part series on clubfoot. Next week we will discuss the treatment for clubfoot, the prognosis and what you can expect as a parent of a child with clubfoot. In addition, we will discuss the types of children who are available and what you can do if you are interested in adopting one of these children who are members of the In His Image program. Many of the more than 2,000 children who are on the China special needs list have clubfoot. In general, it is condition that can be readily treated and treatment may begin while the child is still in China. It is called congenital talipes equinovarus, and is one of the most common deformities of the lower limbs [reference 1]. It involves the bone and soft tissue, usually causing one or both feet to be turned sideways or upward. 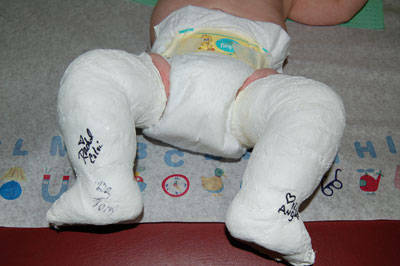 In most cases, a club foot twists the top of the child’s foot downward and inward. If it is severe, the foot will look like it is upside down.